I hate weeds. I have since I was a little girl. Still, I love flowers and vegetables and being out in the yard plucking and pruning. I have since I was too little to remember. Perhaps it allows me to share in creation. Perhaps it gives me some feeling of control over something. Yet, sometimes I let a plant grow, just to see what it becomes. I fail to recognize, categorize, or otherwise understand whether it is friend or foe. 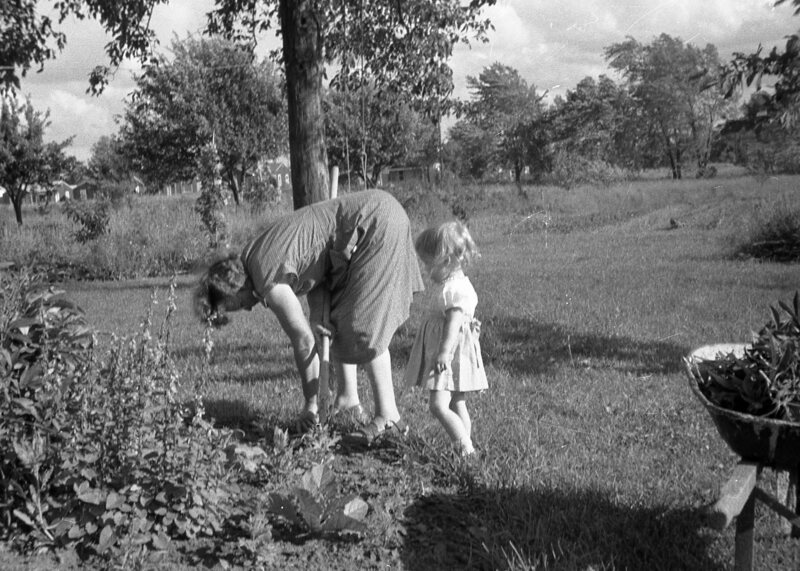 Like camping, gardening was passed on from one generation to another. Mom loved to garden, but she had no luck at all. The only flower she grew was gladiolas. I hate those things, ’cause everybody sent those to funerals. Smelling them made me think somebody died. The glads, as Grandma called them, were back behind the sandbox, beside the asparagus. 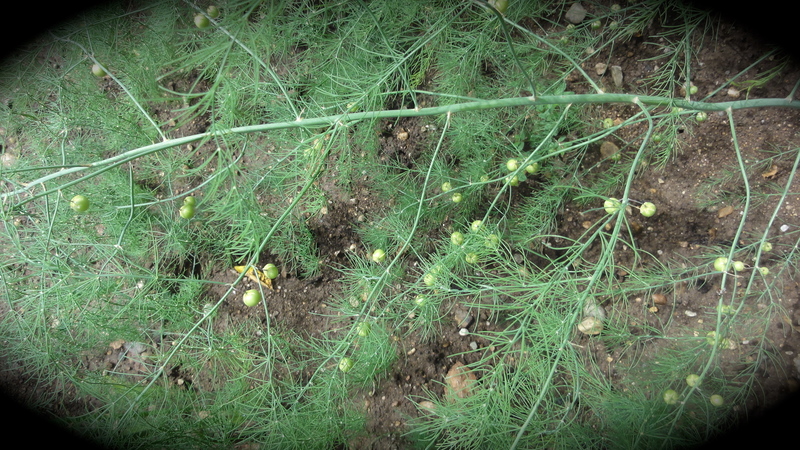 Mom was good at growing asparagus, but not so good at cutting it, on account of asparagus grows super fast and gets woody, then it’s no good to eat. I liked the way it looked when Mom forgot to cut it and it went to seed. It got all feathery soft, like something that grew on a far off planet I saw on The Outer Limits. That show gave me the heebie-jeebies, not so much when I watched it, but after I went to bed. That’s part-way why I never slept with my toes or had sticking out of the covers. Mom tried and tried to grow a smoke bush, but somebody kept running over it with the lawnmower. No matter how much staking and flagging she did, that smoke bush was dust. She probably should have planted a humongous boulder right by it, so the lawnmower blades got twisted before the smoke bush did. That way, she’d catch the culprit, too. Deanna was always running over something that made the mower go kaput. Never on purpose, but stuff got buried under all that grass. Well, to tell the truth, I did like running over ant hills and Kleenex, but those things never hurt a lawnmower. Mom had good luck growing weeds. Once she grew a great big one and thought it was a tomato plant. That was before I was around, back when she and Dad and Deanna lived in Grandpa C’s little house. I never knew Grandpa C on account of him having a heart attack before I was born, but when I heard the story about Mom cultivating that weed, and Grandpa coming out every day and congratulating her on her fine garden, I knew just what he looked like in real life. Sure, I saw pictures of him, but that’s different, ’cause I had to imagine how that smile got on his face and the low sound in his throat he made when he swallowed a laugh. When I heard Mom’s story, I knew for sure that Grandpa C’s smile slid up one side of his face and twinked across his eyes like shooting stars; same as Dad’s. I saw it in my mind’s eye, clear as if Grandpa C stood right in front of me. I wondered how Mom missed that. I could never pull one over on her. On the other hand, once Dad told me some old rock I was studying was a petrified potato. I got so excited I took it right to school to show Teacher. Maybe when I heard what I want to hear, I sorta got blinded. About seven years ago, I got all excited about a native flower sale at the local community college. I bought myself a trunk load of small plants and planted them all over my yard. I looked forward to seeing a Grandma Z sized flower garden. Most of those native flowers are plain old weeds; I don’t remember any of their names. They’re the kind that bloom and spread seeds all over. I am pulling weeds left and right. Still, there are times when I see a new sprout and I just must let it grow and see what it yields. Sometimes it is a happy surprise. You tell me, which of these are weeds? And which got someone laughing up their sleeve at me? The promise of an easy garden blinded me to the truth and made somebody else might happy. They all look beautiful to me. Let them grow! So true. I consider them weeds when they won’t stay in one place. Oh, you should see the “ornamental grass” that’s growing everywhere! It’s taken over everything. Weeds are so in the eye of the beholder, aren’t they? Your idea of waiting to see whether a plant is a flower or weed is very wise, that’s what Jesus plans on doing in His great harvest…He lets the tares grow up with the wheat… :D. I think you’re flowers are lovely and I love that you are playing with Native plants. My mom did that this year, replanting as many violets as she could. She now has a whole hill full of violets.